Blue Line Aviation, a flight training provider, has announced a partnership with Johnston County Public Schools’ Cleveland High School by introducing the school district to the Aircraft Owners and Pilots Association (AOPA) High School Aviation Curriculum. Recently approved for the curriculum by AOPA, Cleveland High School is expected to implement the coursework in time for the 2019-20 school year. The curriculum features two career and technical pathways — pilot and unmanned aircraft systems (drones). Each pathway will be four years in length. Cleveland High School will join more than 100 other high schools across the U.S. to provide the aviation curriculum, up from 80 schools in the 2018-19 school year. Currently, 53 percent of the students using the ninth-grade aviation curriculum are in underrepresented groups, and 25 percent of the students using the aviation curriculum are female. Blue Line Aviation worked closely with Suzanne Lujan, Johnston County Public Schools executive director of career & college readiness, to bring the aviation curriculum on board. Blue Line Aviation will provide enrichment to the program with Cleveland High School by making its staff available to students and teachers within the program. Blue Line Aviation will help in the classroom, help coordinate field trips, and help expand upon various curriculum topics. Blue Line Aviation is also working to continue its partnership with Johnston County Public Schools to develop an Airframe and Powerplant (A&P) Mechanic Apprenticeship. Blue Line Aviation will be holding meetings in the near future with key leadership and stakeholders in the Johnston County Community to discuss the industry need and framework of how this will get accomplished. According to the North Carolina Department of Commerce, in 2016 just 21.2 percent of citizens in Johnston County had obtained at least a bachelor’s degree. Programs like the A&P Mechanic Apprenticeship will allow students to pursue a career in aviation without a college degree. The partnerships that Blue Line Aviation is developing are crucial due to the projected shortages facing the airline industry. Blue Line Aviation wants to continue to show students and even adults the numerous career options in aviation. The upcoming aviation shortages are staggering. Boeing’s Pilot & Technician Outlook for 2018-2037 projects that the industry, which includes commercial aviation, business aviation and civil helicopter industry, will need 790,000 new civil aviation pilots, 754,000 new maintenance technicians and 890,000 new cabin crew in order to maintain the world fleet over the next 20 years. According to the Outlook, the demand will come from a mix of growth, retirements and attrition. Meeting the extraordinary demand will require proactive planning and collaboration within the global aviation industry. Blue Line Aviation is doing its part to help meet those demands for the future by educating schools and youth about aviation and career paths in aviation, and training transitioning military pilots. 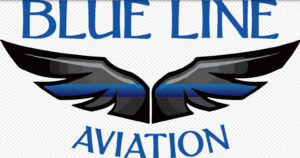 Blue Line Aviation has a commitment to community involvement and becoming a resource in the Johnston County Community. The airline industry is critically important to the national and local economy. According to the North Carolina Department of Transportation Division of Aviation, the state’s 72 public airports contribute $52 billion to the state’s economy. Those 72 airports support 307,000 jobs and generate $12.6 billion is personal income and $2.2 billion in state and local tax revenues. The partnerships with schools in Johnston County are just one way that Blue Line Aviation will become a resource in the community as the flight school prepares for its move to Johnston Regional Airport by next year. A family-oriented business, Blue Line Aviation wants to grow its family by continuing to develop relationships with community leaders and businesses in Johnston County. The $13 million, 50,000 square foot Blue Line Aviation Complex that is currently under construction at the Johnston County Airport will feature a professional pilot training center, a restaurant and rooftop terrace, 18,500 square feet of hangar space, a simulator room, executive and administration offices, briefing rooms, a fitness center and a conference hall. The complex will become a destination spot for community members and neighboring businesses. It will be a place that sparks the interest and excitement of the aviation industry into our youth and community. Over a 10-year span Blue Line Aviation is expected to create approximately 134 jobs and employ approximately 300 people.